Located by the side of the river Periyar, the Periyar Wildlife Sanctuary is the main attraction of Thekkady. Spread over an area of about 777 sq km with about 360 sq. km of which is thick evergreen forest, the sanctuary was declared a Tiger Reserve in 1978. However, the Periyar Wildlife Sanctuary can also be recognised as one of the natural treasure houses of some of the rare species of flora and fauna. The flora of the park includes over flowering plants, grass species, species of orchids and the only South Indian conifer Podocarpus Wallichianus. Apart from the tigers, the fauna of the park includes wild elephant, gaur, sambar deer, wild boar, Nilgir Tahr, lion tailed macaque, bonnet macaque, Malabar giant squirrel, flying squirrel, tiger, jungle cat, sloth bear, hornbill, stork, woodpecker, kingfisher, raptor, cormorant, grackle, darter, cobra, viper, krait, monitor lizards, frogs, toads, masheer (famous and endangered game fish of India) and otter. Noted for its geo-morphological diversity of wildlife and scenic beauty, the Reserve attracts visitors from all over the world. The splendid artificial lake formed by the Mullaperiyar Dam across the Periyar river adds to the charm of the park. This is the only sanctuary in India where you can have the unique experience of viewing wildlife at close quarters from the safety of a boat on the lake. The greatest attraction of Periyar remains the large herds of wild elephants that come down to the lake’s edge. The lake of the Periyar wildlife sanctuary makes an important site to visit in Thekkady. This splendid artificial lake formed by the Mullaperiyar Dam across the Periyar River adds to the charm of the park. Periyar is the only sanctuary in India where you can have the unique experience of viewing wildlife at close quarters form the safety of a boat on the lake. Murikkady : Located at a distance of just 5 kilometres from Thekkady, Murikkady is another important site to visit. Murikkady is particularly famous for its panorama of cardamom, coffee and pepper plantations. A must visit to include in your excursion itinerary. 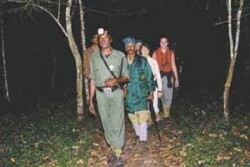 Go for a night patrol with the forest authorities accompanied and forest guards. 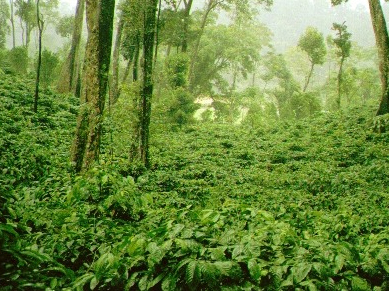 The fertile land of Kerala has an abundance of tea, coffee and spice plantation of various sizes. 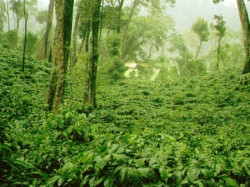 Thekkady is especially known for its the cardamom, pepper, vanilla etc. Also learn how to make natural rubber from latex oozing out of rubber trees. 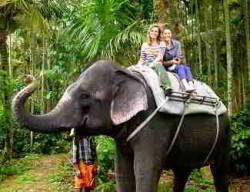 Elephant rides are very common and popular in Thekkady. 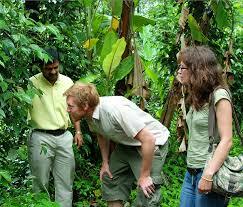 They are available not only in the Periyar Tiger Reserve but also in the various spice plantation compounds. 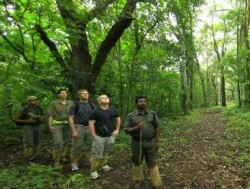 Among the many programs arranged at the Periyar Tiger Reserve, the Nature Walk is a trail that takes one through dense deciduous forests and swampy grasslands. A local tribal guide will accompany a group of 5 persons and venture into a perfect exploration.